Global polyimide films market was valued at USD 2.1 billion in 2017 and is further expected to become USD 4.1 billion by 2024. The rapid increase in this market is attributed towards increasing applicability of these films in the manufacturing segment of electronics and semiconductor components. Polyimide films comprises of an exclusive amalgamation of thermal, electrical, mechanical and chemical properties that resist vibration and extreme temperatures. These films are gaining huge popularity owing to its innovative design solutions provided to several industries such as wind energy, consumer electronics, aerospace, industrial applications and automotive. On the basis of application, market is segmented into flexible printed circuit, pressure sensitive tape, specialty fabricated product, wire & cables, and motor / generator. 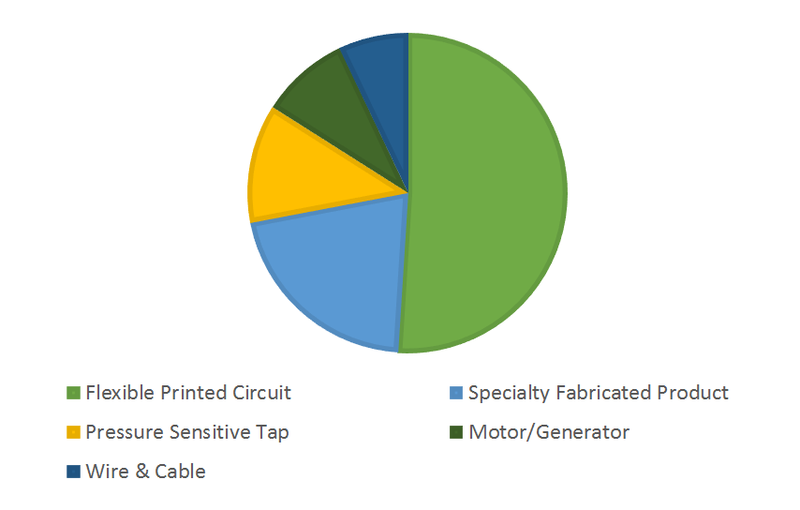 Amongst these applications, flexible printed circuit segment is expected to witness highest growth of 10.7% in terms of value during the forecast period. As these circuits are extensively being used by various end-use industries in which electronics and automotive are the major consumers. The demand for polyimide films in this segment is anticipated to be high as the flexible printed circuits are broadly used for improving performance and decreasing the size of electronic systems. On the basis of end-user market is segmented into electronics, aerospace, automotive, mining & drilling, labelling, medical, and food and beverage. Among these industries, the electronic segment is expected to witness fastest growth with a highest CAGR of 10.6% in terms of value during 2018-2024. Additionally, polyimide films offer exceptional insulation properties under rising temperatures and acquaintance to destructive chemicals. Moreover, these films provide outstanding chemical, temperature control and project flexibility to equipment and manufacturer developers. Henceforth, electronics end-use industry is the largest user of polyimide films market globally. The increasing demand for polyimide films is widely being inclined towards the amplifying demand for electronic products across the globe. It has been observed that the polyimide films are being consumed in the production of flexible circuits that are dispersed in several number of consumer electronic products for instance in laptops and smartphones. The widespread application of these films in the aerospace sector due to its light weight helps in improving the performance of the engine and helps in saving fuel is further bolstering the growth of polyimide films market across the globe. Moreover, the expanding demand for the consumption of lighter electronic products is anticipated to boost the growth of this market in the near future. Additionally, wireless communication and flexible displays are further expected to provide rewarding growth opportunities to the growth of this market by 2024. The global market fort polyimide films is anticipated to witness hindrance in its growth trail owing to high cost being incurred while processing polyimide films as these films are being molded with the help of several film casting techniques that requires soaring temperature. Moreover, poor resistance of these films to hydrolysis makes its application complicated in the humid weather. These factors are further expected to restraint the growth of global polyimide films market in the near future. Globally industry players are leveraging market growth through product innovations and constantly upgrading technology. The key players in this industry are selling superior quality polyimide film that holds an exclusive convergence of properties that makes it suitable for application in several industries across the globe. Geographically, Asia Pacific is expected to witness fastest growth of 10.8% in terms of value during the forecast period. The key countries that are attributing high demand for the polyimide films in the region include China, Japan, South Korea and India. The major factors that are driving the growth of this market include price deflation, increasing household incomes and upgradation of technology. Moreover, these factors are further expected to escalate the growth of this market for polyimide films during the forecast period. Additionally, increasing disposable income and price deflation in this region has elevated the consumer electronic products demand that is further expected to drive the growth of polyimide films market. Moreover, it has been observed that North America held the second largest share of the polyimide films market in 2017 due to increasing utilization of these films in advanced aerospace industry, mounting use of insulation tape in automotive industry and application of PI films in healthcare sector. Some of the major players operating in the global polyimide films market are Kaneka Corporation, Saint-Gobain S.A., E.I. Du Pont De Nemours and Company, Arakawa Chemicals Industries, Ltd., SKCKOLONPI, Inc., Yunda Electronic Materials Co., Ltd., Taimide Tech. Inc., I.S.T. Corporation, FLEXcon Company, Inc., and UBE Industries Ltd.
10.4. Arakawa Chemicals Industries, Ltd.
10.6. Yunda Electronic Materials Co., Ltd.
Table 77 Snapshot - Saint-Gobain S.A.
Table 79 Snapshot - Arakawa Chemicals Industries, Ltd.
Table 80 Snapshot - SKCKOLONPI, Inc.
Table 81 Snapshot - Yunda Electronic Materials Co., Ltd.
Table 82 Snapshot - Taimide Tech. Inc.
Table 83 Snapshot – FLEXcon Company, Inc.
Table 83 Snapshot – UBE Industries Ltd. Note:- Financial insights & Recent developments, are subject to availability of information in secondary domain.